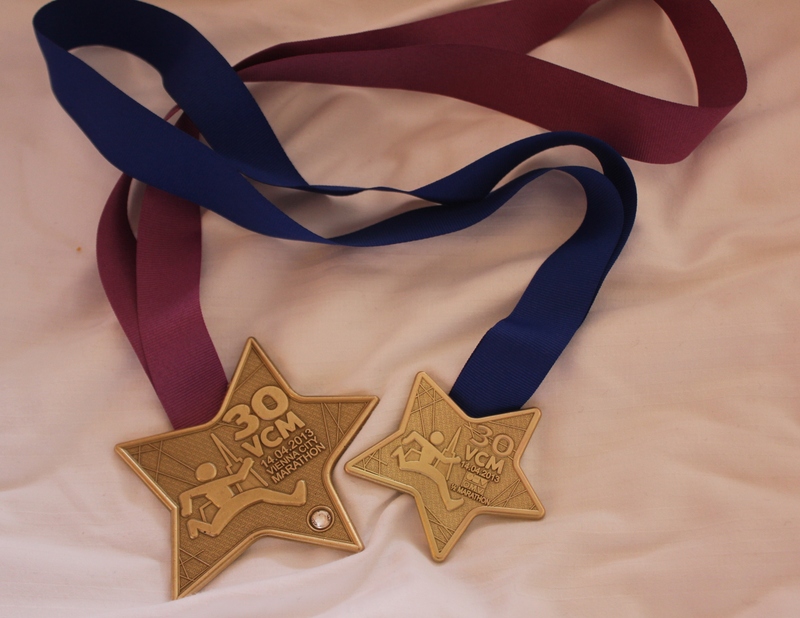 In April this year I ran my first 21.1 km; the Vienna City OMV Half Marathon, in Austria. I had registered six months earlier after returning from Berlin where I had watched Dano run his second marathon. Inspired by this I signed up. Dano and I decided on Vienna as it offered both full and half marathons and also because it was going to be the event’s 30th anniversary. Although I had six months to train I didn’t start until three months before and it was sporadic and disorganised. Training consisted of a few 10 km runs, the Run Through Bushy Park 10 km, the Whole Foods Market Breakfast Run (8.2 miles) and a 16 km run a couple of weeks before race day. Other preparation consisted of choosing a race top (the brighter the better, with obligatory name transfer on front), new shoes (New Balance, for my neutral gait, and also very bright), as well as compiling a suitable play list on my MP3 (which of course had to include Ultravox’s Vienna). The thought of running 21.1 km without music was unimaginable. We flew to Vienna on Friday evening and took it easy on the sightseeing the next day to keep our legs rested for Sunday’s race. We visited the expo however, at Messe Wien near the Vienna Prater, which we thought was average (compared to Berlin/Barcelona expos) and there were lots of pushy people. 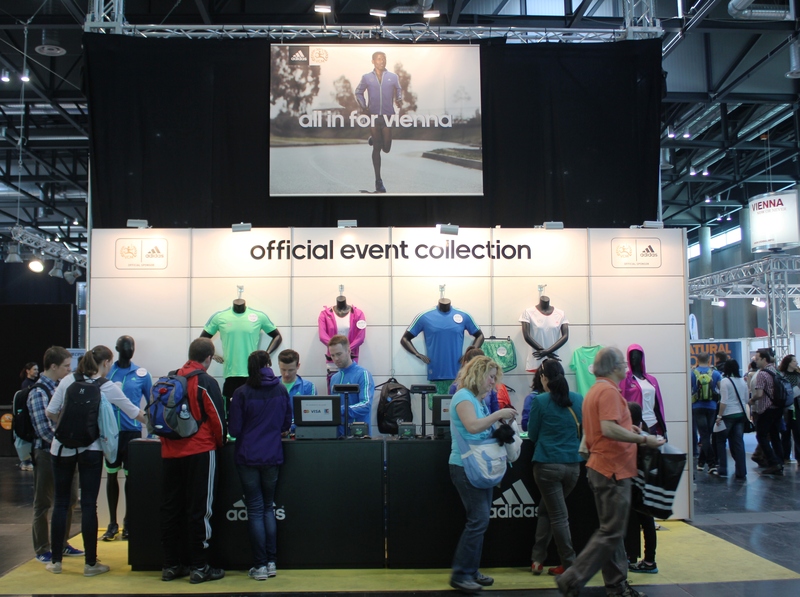 There were two different collection points at the expo; one at which to collect your chip and at the other, your race number and goody bag. Adidas, the sponsor, had some nice but expensive kit on sale, including the official yellow and white race shirt but we managed to find a cheaper version of the same shirt (but made of a different material) for only 25 euros. I was raring to go on race day morning. It was a short metro ride to the starting area near the UN Buildings on Wagramer Straße, just over the north bank of the Danube. Baggage trucks were easy to locate however the starting area was a bit confusing. Although colour-coded on the website, there was no colour-coding at the starting area. In fact, it was the sponsor names on the various balloon arches which was the key to finding the correct starting area. Eventually figuring this out, I found my area – right at the back. Balloons released into the air indicated the start of the race. About 9 minutes after, I found my way over the start line and running uphill, straight over Reichsbrücke. I kept to the far left and looked out over to the left for views of the Danube as I crossed the bridge. Over the bridge and along a straight road, the course lead us through a park. At around the same time the sun came out so I tried, where possible, to run under the shade of the trees. Once through the park we headed along the Danube Canal. I warmed up at about 6 km, soon after which the first refreshments, in the form of cups of water, wet sponges and hoses, were available. Banana skins and plastic cups from those before us paved the roads. Over the Danube Canal, close to 9 km, there was a wave of excitement as the elite runners passed down the same street in the opposite direction to the trailing runners. Runners waved and cheered as they passed and was just the right motivation needed at the mid way point. 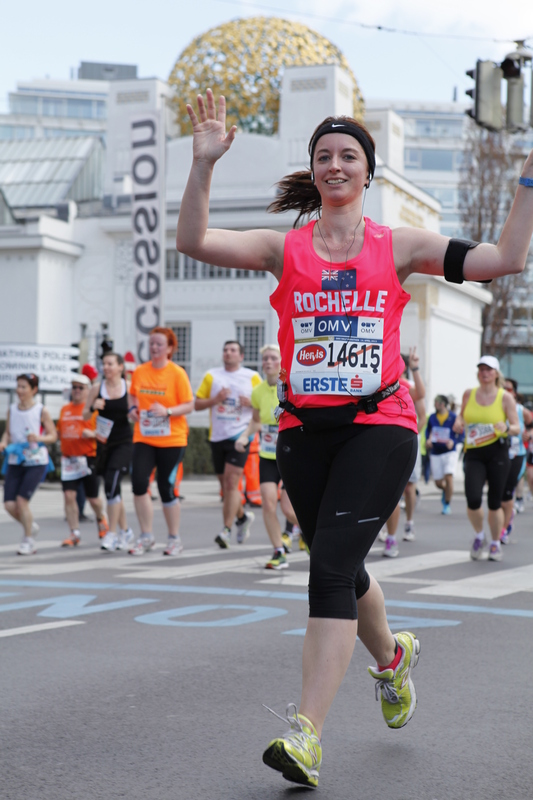 By 10 km I had taken my second electrolyte gel and by 12 km I was powering along high fiving children spectators. There was great support by the spectators from start to finish. By 15 km I started the countdown to 21.1 and found myself looking ahead for each subsequent distance marker. My knees started to ache as I headed into 16 – 18 km, which was something I hadn’t experienced before and it slowed me down a bit. The facades of the beautiful Viennese buildings however were a good distraction and I looked up high to the surrounding buildings to take in the scenery. The anticipation to see the finish line peaked after the 18 km marker was passed. My knees were aching so much I considered stopping and walking a bit but the competitor inside of me was conscious of the time and at 20 km I was within reach of finishing under 2.5 hours which was better than what I was anticipating. The last 1.5 km was the most exhilarating as I imagined what the finishing area would look like. Even nuns were out supporting from the sidelines. In the last half kilometre I had an amazing spurt of energy and sprinted downhill and around the last two corners turning onto the finishing straight, Heldenplatz, which was lined with yellow carpet and surrounded by supporters in grandstands. Crossing the finishing line in my first half marathon in 2:31:57 was an amazing feeling and I raised my arms in celebration as I finished. Thanks. Pays to look around 😉 Looking forward to Amsterdam half now.